Built by an Amish craftsman in Holmes County, Ohio, this Amish Karina Dining chair has a Scandinavian furniture feel. The shapes featured in the chair back are modern and crisp, creating a dynamic design for your dining room furniture collection. For all the special moments shared in your dining room, these are the dining chairs that will offer ultimate comfort as well as a distinct style. Take a look at the Bedford Amish Dining Table for an exciting match for this contemporary design. 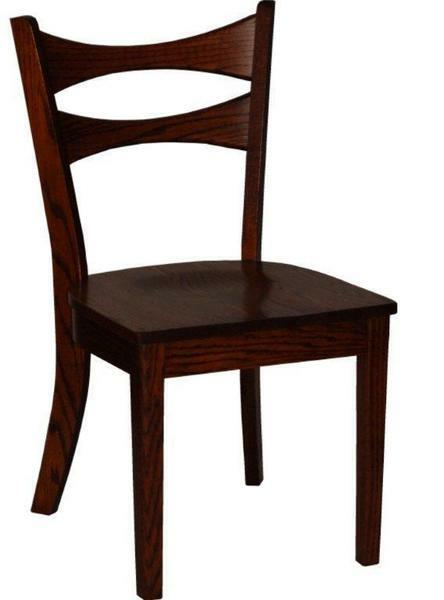 Choose from red oak, cherry or brown maple wood for these Amish made Chairs. Only the finest premium hardwoods are used to handcraft this heirloom quality furniture. Amish furniture is yours to customize and a wood, fabric or leather seat are offered for you to choose from. We are happy to send you samples to aid in your decision.